Parkside, the dormant residential and commercial development that extends from Hog Mountain Road to Mars Hill Road, has come back to life. 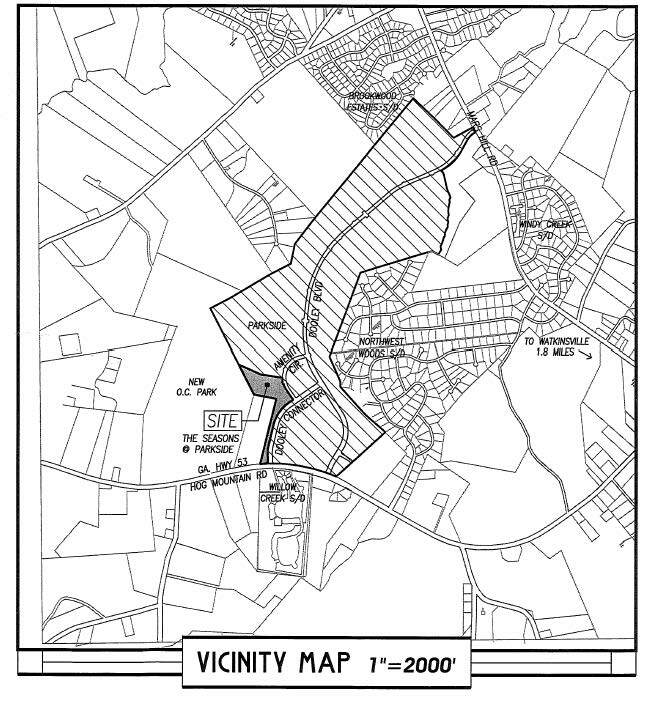 The Oconee County Development Review Committee is scheduled to consider a revised preliminary plat for seven phases of the 469-acre master plan development at its meeting on Friday morning. 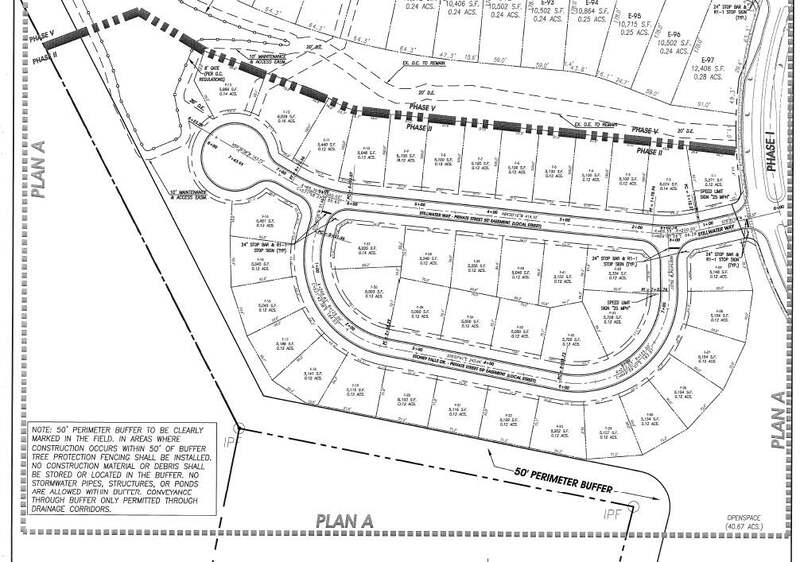 The review committee also will review construction plans for a 41-lot section of the development that connects to Hog Mountain Road as well as two roadways linked to the 16 acres containing those 41 lots. Parkside includes 810 residential lots on 253 acres, 110 acres of open space, and 50 acres of commercial development. Parkside will require and holds capacity for residential sewer, putting additional pressure on the county as it struggles with its limited sewage capacity. The Oconee County Board of Commissioners approved the rezone for Parkside in 2004 as part of a string of controversial master plan developments in the county. The development wraps around Northwest Woods, and residents complained that the massive development would adversely affect their neighborhood. The development was described as the equivalent of a new city inside the county, with many expressing concerns about its impact on the county’s school system. The revival of the project comes at a time when Oconee County School officials are expressing concern about the impact of increased residential development on the county’s schools. The 2004 rezone request was put forward by Plant A Seed LLC, but the developer listed on the site plans now is called Parkside Properties LLC, 2300 Pete Dickens Road, just outside the limits of Bogart. Mark Jennings, a local developer, is listed as the contact person. According to county tax records, the properties went through a series of banks before being purchased by Parkside Properties in 2013. While much of the infrastructure for Parkside is in place, entrances to development off Mars Hill Road and Hog Mountain Road have been fenced for years. The county did approve overall preliminary plats for the residential complex in 2005. 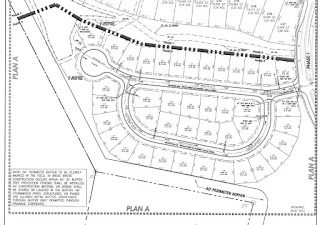 The plans for the 41 lots that are schedule to be reviewed on Friday are for a phase referred to as The Seasons At Parkside that will have access to Hog Mountain Road via the roadways called Amenity Circle and Dooley Connector. The residential lots are small, with most being just 0.12 acres. Average lot size for the 810 residential parcels in Parkside is just 0.31 acres. The master plan developments spread around the county mostly were approved in retiring Board of Commissioner Chairman Melvin Davis’ first term, from 2001 to 2004, and have become an issue in the current campaign to fill the open spot on the Board. A negative advertising mailed from the postal box of candidate Marcus Wiedower, but without any identifying source, attacked candidate Chuck Horton for his role in approving residential development when he was on the Commission from 2005 to 2012. The ad showed dark images of homes clustered tightly together, as is the case with master planned developments, such as Grove Park, now visibly under development on Hog Mountain Road near Parkside. The 2004 rezone for Parkside was before Horton joined the Commission but when Wiedower was working as a planner for Beall, Gonnsen and Company, the company that represented Plant A Seed in requesting the rezone. The company was a key advocate of master plan developments. Horton and Wiedower both said the master plan developments in the county were a mistake in separate interviews I conducted with them in September. Voting in the runoff is tomorrow, with the polling places open from 7 a.m. to 7 p.m. Turnout in the election was light in early voting. The Development Review Committee is made up of representatives of the Planning Department, the Public Works Department, the Office of Code Enforcement, the Department of Environmental Health, the Utility Department, and the Emergency Management Assistance/Fire Department. The meeting on Friday starts at 9 a.m. in the Government Annex on Greensboro Highway on the south of Watkinsville. That place is hideous. Why would anyone buy a shoddy built house on a speck of land? They will never pay for the negative impact on the county. You can kiss the school system goodbye and say hello to a increasing crime rate. today is the last day to vote in this very important run-off. get out and VOTE for your homes, your schools, your quality of life, and beautiful oconee county! Ah, Abe Abouhamdan again shows up in the plans for a huge, big-money project with many deleterious effects upon the resources of the Oconee County plum. How he is still involved in the planning and zoning of the county is beyond comprehension. This is a clear and important voting day for the future of Oconee County. Mr. Wiedower represents those who want to build out our county for the financial benefit of the privileged insider few. This is edited to remove one paragraph. 41 houses on 0.12 acre lots (about 3650 sq. ft. lot), the size of an average sized house in Oconee Co. equals about 5 acres of land that these houses will be built on!! Assume 2 kids per household. The schools are going to be overwhelmed with this and other MPD's developing as the sewer capacity becomes available. Notice too it is right next to Vet. Memorial Park. Who is going to police the park after hours? Mr Gentry has already said his staff is overstretched. Is this the Oconee Co. we have called home. Better start taking pictures because in a very few years we will not recognise our county. How is this and the other MPD's going to effect mine and other homeowners valuations when we get ready to sell? Not at all what I was expecting. I agree with Jay Sultan about the density and impact on services. My memory is that the donation of land for school and fire station was rejected by the BOC because it was included as part of the green space. I wish they would have started on the larger lots that would have had larger houses that would bring in more tax dollars. Even though we have one of the best fire departments around, when a fire breaks out in one of the MPD's it will be devastating and difficult to put out. Too bad so many of them were passed during that short period of time. Does anyone know when the commercial component has to be built in relationship to the residential?